Below is an email from Pastor Conrad Mbewe announcing the first graduation of the Lusaka Ministerial College, an institute supported by HeartCry for the training of indigenous pastors in Zambia. 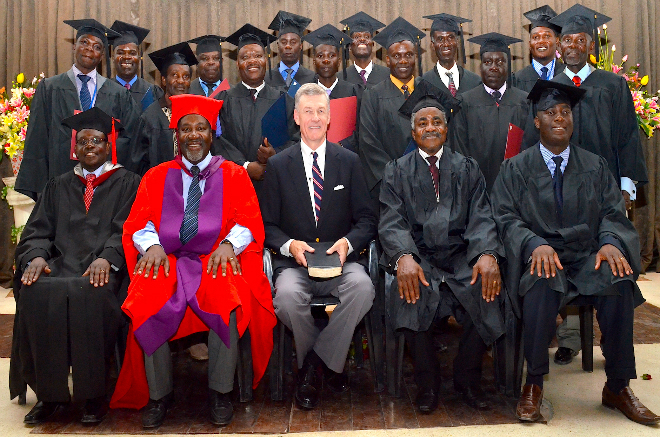 The first graduation ceremony of the Lusaka Ministerial College took place on Thursday 27th August 2015 during the Zambian Reformed Conferences. The LMC targets the poor densely populated areas of Lusaka, where half to two-thirds of people in Lusaka live. These are unplanned areas with houses almost being on top of each other, though in some of them the government has brought in some semblance of order. Whereas almost all the houses have electricity, ninety percent of the roads are untarred and very few houses have running water. These are the areas where most cults gain their first foothold and then flourish upon getting a large following. The crime levels and vices such as drunkenness and prostitution are very high compared to the other areas of Lusaka. The churches are largely unable to do anything about this because their pastors are largely untrained. These are the areas that we are targeting as LMC. LMC currently has four lecturers who are all full-time pastors: Isaac Makashinyi (MDiv), Oswald Sichula (MA), Kennedy Sunkutu (MPhil, former HeartCry missionary), Ronald Kalifungwa (BA), and myself (PhD). We have also used other adjunct lecturers to train the men. After four years, plus some months, the first set of graduates of the LMC finally came to the end of the "factory" process. Of the 14 who graduated, 6 did so with diplomas and 8 did so with certificates. For more details, see our new website (http://ministerialcollege.com). Because of the high levels of poverty in these areas, we do our best to make these studies as affordable as possible. We thank all of you for your support, which has made this possible for us. The Reformed Baptist Church in Louisville and later HeartCry Missionary Society have been our main helpers financially, while others have given us one-time gifts in terms of finances and books. Please continue to strengthen our hands as we seek to train men for the work of ministry in these very needy areas of our capital city. We long to see stronger churches there. Lusaka Ministerial College is also running block classes for Lozi pastors in Mongu, where we currently have about 40 students. This is yet another neglected area of Zambia, as Sean Reece will testify. Pray for us!